"David was a valuable addition as an instructor to a large IT project of upgrading the university to MS Exchange with use of MS Outlook. David provided the training resources for this project and was an integral part to its success. Hundreds of surveys confirmed that each person that participated in David's instruction gave him top marks." 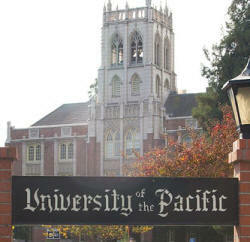 University of the Pacific made the decision to change their email platform from GroupWise to Microsoft Exchange and Outlook. The Office of Information Technology (OIT) knew that their employees (nearly 3000 spread among Sacramento, San Francisco, and Stockton, California) would need training on Outlook 2003 in a timely manner they migrated to the new system. Hands-on classes were offered to the Stockton campus's 2000 employees consisting of faculty and staff. Approximately thirty classes were scheduled on campus in a computer lab capable of accommodating up to 25 participants. These two-hour classes were on a variety of dates and times. The class generally focused on composing emails, organizing the inbox, making use of the calendar, and differences between Outlook and Groupwise. Specific highlights included features new to Outlook 2003, as well as calendar sharing and time-saving tips. One of these sessions was videotaped and made available via campus intranet for employees to view online. For users who required additional help, or who were unable to attend, Applied Office trainer David Diskin went to individuals' offices to provide one-on-one assistance. For some departments and schools at Pacific, David Diskin provided a group demonstration for 50+ individuals allowing them to ask questions and learn about new features of the software. Approximately 300 employees have passed through one-on-one training in the Stockton campus, with an additional 150 employees having attended a group session, and ten individuals taking advantage of one-on-one assistance. With the Stockton campus migration complete, Applied Office is now working with staff in the San Francisco and Sacramento campuses to deliver similar training. Post-training surveys showed favorable results from all attendees, and several comments from staff and faculty confirmed the value of the classes.